Sony has added a third model to the firm’s innovative full-frame A7 mirrorless camera line-up, concentrating on high sensitivity, low noise and a wide-range of video capture options including 4K from its full-frame sensor. Shunning the hi-res’ imaging of the A7 and A7R, the A7S adopts a sensor with a mere 12.2-million pixel count but with an expansive stills sensitivity of 100-102,400 (expandable to ISO 50-409,600). The new specially developed sensor is also the first to deliver UHD (4K) video from the full width of the sensor without pixel binning, albeit limited to HDMI only. With third-party external recorders starting just under $2,000 (for the recently announced Atomos Shogun), though that makes it an expensive option. Fortunately the A7S has a complement of Full HD (1920×1080) video modes recording to the SD card at frame rates up to 60 fps with a range of recording formats including XAVC S with bitrate encoding up to 50 Mbps. Native sensitivity in movie capture echoes that of stills, and it can be expanded to ISO 100-409,600. Other features include the 25-point contrast-detection AF system from the A7R albeit modified with sensitivity to a unusually low Ev-4, XGA OLED EVKF, WiFi with NFC capability and Sony are developing a new XLR-type microphone adaptor kit using the camera’s multifunction shoe. 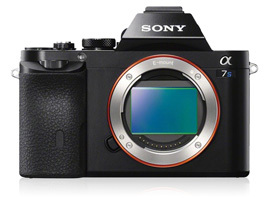 The A7S is available for pre-order at $2,498 body only. 25 point contrast AF module with sensitivity to -4 Ev. 1/8000th top shutter speed, 1/250th flash sync. 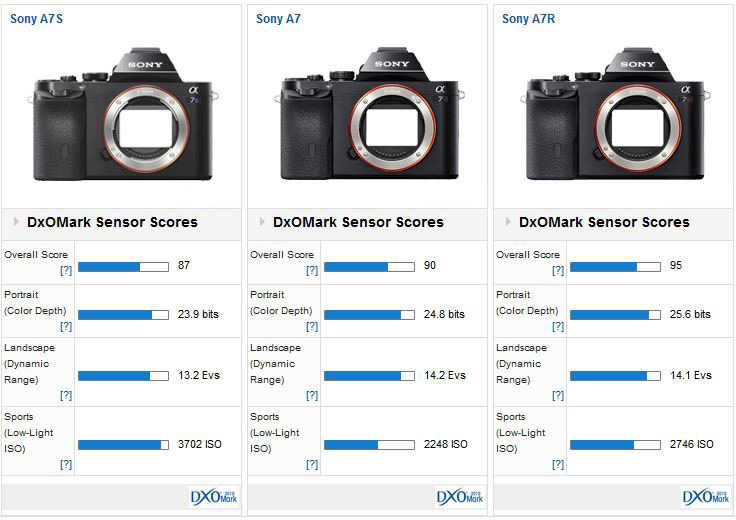 The Sony Alpha A7S achieved an overall DxOMark sensor score of 87 points putting it on a par pretty much with rivals such as the Nikon Df and D4, the older D3X and just ahead of the Leica M (Typ 240). It’s a good score overall, but the color depth and, perhaps, dynamic range are slightly lower than we were expecting, given the maker’s claims. 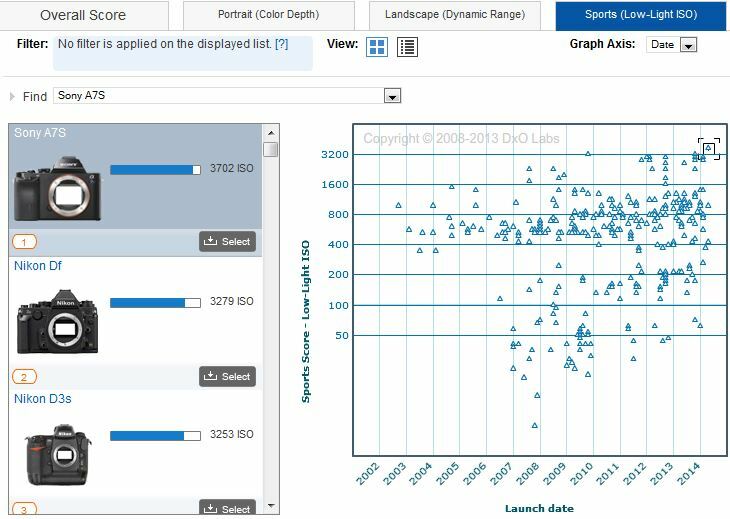 The low-light score of 3702 ISO, however, is the best we’ve seen. The low light capabilities are on a par with the best – the Sony A7s is the highest-ranking model in this category. 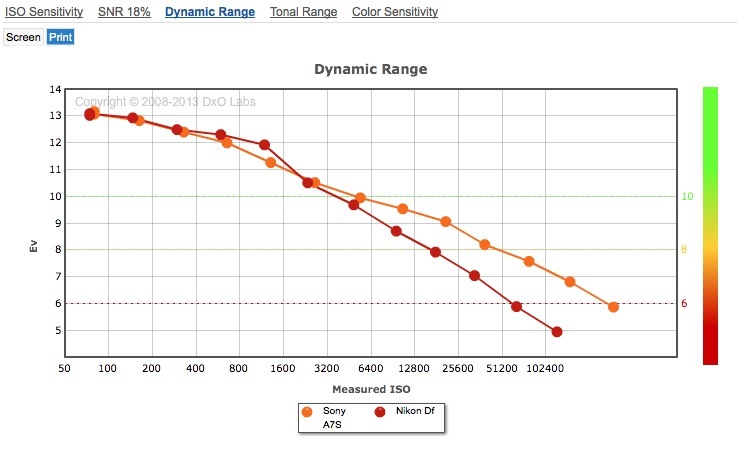 Our previous best performing model in the low-light category was the $2,746 Nikon Df. It has a slightly higher pixel count 16.2Mpix CMOS sensor and achieved at low-light score of 3279 ISO. The new Sony betters the Nikon Df, but it’s a mere +1/6 stop improvement – barely noticeable in real world use. The two are pretty close elsewhere. The Nikon has slightly better color discrimination and similar dynamic range at base but any advantage gradually diminishes with higher ISOs. From ISO3200 onwards, for example, the Sony has the advantage, which is all good news of course if you’re intending to use the A7S for available light photography. Although the Nikon has better dynamic range at base ISO, the Sony starts to pull away from ISO3200 onwards – it has an excellent 9.05 Ev DR at the manufacturer’s ISO 25,600 setting. 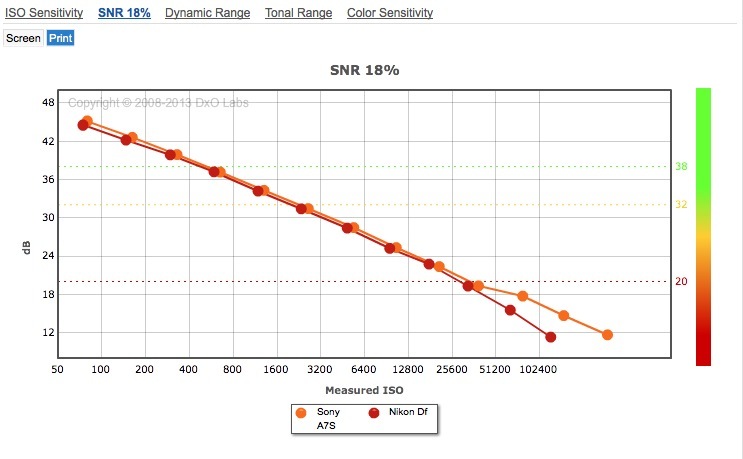 Noise levels are similar between the A7S and Nikon Df with a slight advantage to the Sony, except from ISO51,200 onwards where the Sony has a noticeable lead. 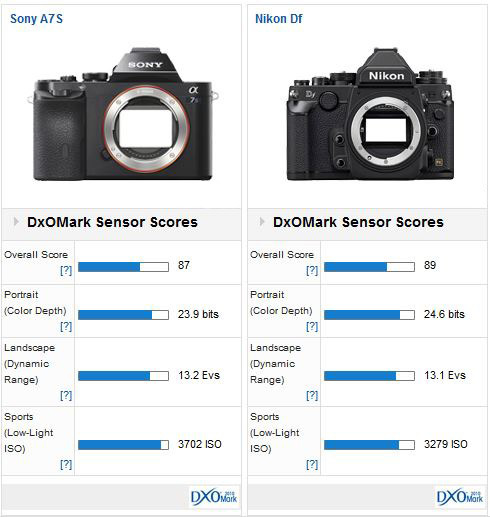 Side-by-side with the firm’s 24-Mpix A7 and the 36-Mpix A7R, the A7S comes closer in the overall score with the former, but it’s someway behind the latter. 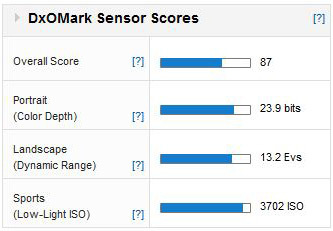 Both the A7 and A7R have similar color depth and dynamic range throughout their native ISO range, while the A7S sacrifices some performance at base for improved performance at high ISOs – from ISO3200 onwards the A7S is measurably better. The same goes for noise levels though as we’ve already proven it’s really only a slight improvement. 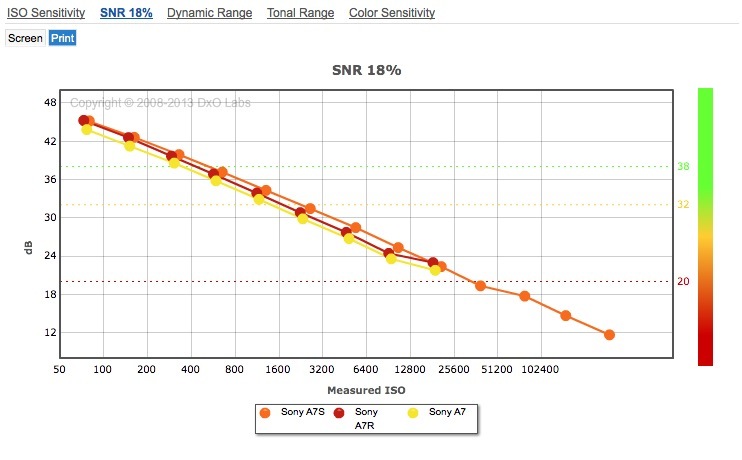 As you might expect of the three Sony A7 models noise levels are lowest on the A7S. Sony’s A7 and A7R models have not unexpectedly generated a lot of interest with enthusiasts, and the new addition to the range looks equally intriguing, if perhaps for different reasons. While it’s true the short register and low pixel density makes this model potentially more suitable with rangefinder type (non-retrofocus) wide-angle lenses, there’s little doubt it will appeal to those who value extreme low light performance over high pixel density. And then there’s the additional attraction of video, with 4K as an option (albeit with a third-party recorder). Even the price doesn’t look too bad against the Nikon Df, which is not only more expensive but can’t quite match the Sony’s low light capabilities and shuns video capture completely.